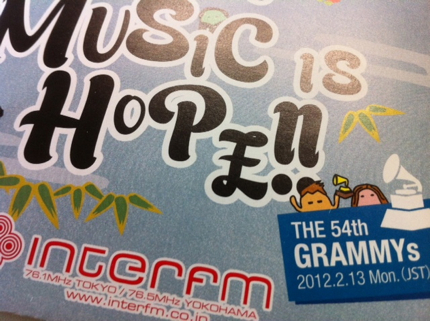 Cartoon Guy and Sayoko on the new Inter FM program timetable flyer!! And I’m holding the Grammy Award. Yay!! Thankyou for listening to my radio programs and connecting with me this year. Happy New Year to you and here’s to a Supersonic 2012!! Join me for Inter FM’s The Day At The Races next Saturday December 17 11am-6pm. We’re going to Nakayama Racecourse in Chiba which has been decorated & illuminated for Christmas!! 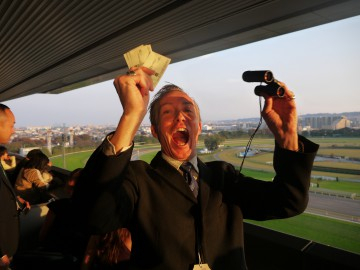 The all free day includes tour bus, drinks & lunch in the VIP lounge, betting tips in English & of course great live horse racing – you could get lucky!! You must email horse@interfm.jp to win. On the streets of Tokyo I bumped into fashion designer, milliner & author Shlomit Yaish who has just published her book Hats On The Streets Of Tokyo. We discuss the book & getting inspired by the fashionable funky cats on the streets of Tokyo – click on the play button below to listen..
Shlomit Yaish (& hat) on the streets of Tokyo!! Click here & tip your hat to Tokyo..
You are currently browsing the GUY PERRYMAN blog archives for December, 2011.